A one day introductory course designed for those interested in becoming involved with cattle. The course assists participants in developing skills in care, handling and management of cattle. All those questions you ever wanted to ask will be answered in a information packed day plus lots of demonstrations and practical tips that you won’t find in any book. 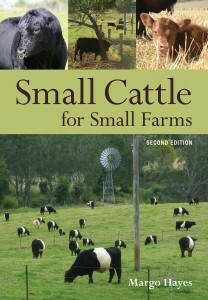 Chief instructor Margo Hayes author of ‘Small Cattle for Small Farms” published by CSIRO. A wide range of topics will be covered including: infrastructure requirements, husbandry & nutrition, how and when to vaccinate, methods of identification, showing, marketing and promotion, beef production and Government requirements. Course is delivered with both indoor and outdoor instruction including a tour of Vitulus stud and commercial animals. $370 Per person per day ($690 per couple) Includes copy of book Small Cattle for Small Farms, class materials, lectures, lunch, refreshments, and farm tour. Limited Places. Couple discounts. If interested either email margo@vitulus.com.au or telephone 0413 153 754 and a booking sheet will be sent. What a fabulous day !! Whether you’re a beginner to the cattle industry or brushing up on today’s requirements, I suggest that this is a day for you. Jam packed with hands on knowledge, literature to keep you on track, information that will lead you where you want to be, its was simply an all round wonderful day. Can’t thank you enough Margo and i look forward to our future in the cattle industry and being able to learn more from you in the future.. I also wanted to thank you for such for such a great course, it was so informative & I learnt a lot, you have put a lot of thought into the contents & for someone like me it was just perfect & not over my head. May I firstly say I had am WONDERFUL time! Thank you so very much for such am excellent day! Please do let me know if there are another cattle events. Actually your day was perfect timing for me. I have not progressed very far with my cattle and was becoming somewhat disgruntled. I have now decided to try a smaller breed. Again thanks so very much I find you very inspiring. I remember leaving your course so happy I did it. So thank you so much. I think you are amazing and you have helped me understand so much about handing the cattle here. In fact I put it into practice straight away handling the cattle here, and my Unclewas very impressed it made him so happy. ( maybe even a little proud ). I thoroughly enjoyed the course last Saturday. It was great you opened up your property to novices and didn’t treat them like “twits” like some farmers brought up on the land can do to novices. You are an excellent teacher and don’t assume any knowledge. Excellent balance of theory and practical. Reading your book after the course made it much easier to understand. It is difficult to find courses, particularly one day courses for beginners in rural skills, so it was very exciting to find your course. I also found it inspiring to hear other peoples stories about why they are making the tree change. I would definitely recommend the course to others and if you ever offer a Cattle Care and Management level 2 course I would be interested. Thanks for taking the time to educate us. We really enjoyed the course and it covered most things for us. We really liked the flexibility in that you covered everything people asked and appreciated you showing us how to apply ear tags when it wasn’t on your program. Greg and Janet Cumberland 2010.